For me, I like to prep in advance. If I don’t, I’m liable to grab anything at hand. Therefore, one way I try to solve my culinary needs (for at least a few days) is to make a base dish. I like to purchase a variety of root vegetables like, carrots, squash, sweet potatoes, etc. And, on the week-end or when I get the opportunity during the week, I do a quick roasting of these beneficial veggies. Like most times, today I was strapped for precious time. I wanted to grab a few more veggies to add to the ones I had in-house; however, I was exhausted. 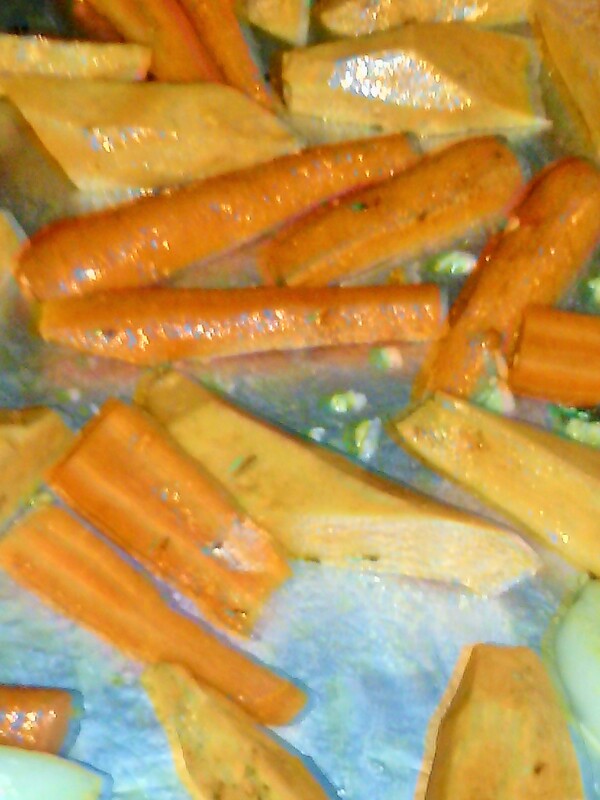 Thus, I decided to ‘rock’ with what I had: carrots, sweet potatoes, onions, garlic. On a baking sheet pan, I drizzled a little olive oil on my root veggies, added a pinch of salt, pepper, cinnamon, thyme, and crushed garlic. Veggies were roasted for approximately 35 minutes in a 400 degree oven until they were caramelized on the exterior. The great thing about roasting vegetables is that it brings out the natural sugar and nutty taste in them. This move provides me with great peace of mind. I know that these root vegetables are packed with amazing nutrients and will keep me satiated for hours. All I need to do is to work around these by adding protein of choice. Already, a huge culinary problem is solved.